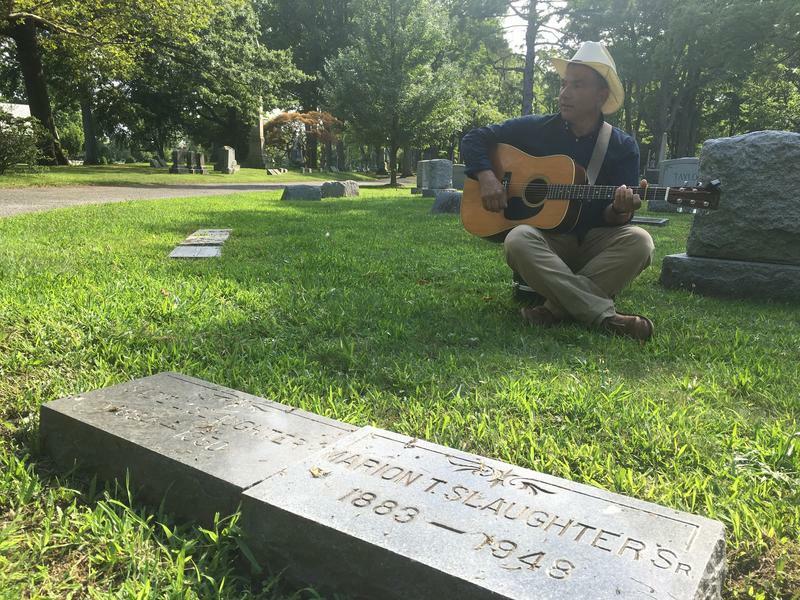 Bluegrass musician Nick Novia plays at the grave of Marion T. Slaughter – known professionally as Vernon Dalhart – in Bridgeport's Mountain Grove Cemetery. There are questions that might stump even the most dedicated country music fan: Who kickstarted the country music industry in the 1920s, even before big names like Jimmie Rodgers and the Carter Family? And why is this Texas musician buried in Bridgeport, Connecticut? By just about any measure, he was the first superstar in American country music. He recorded thousands of songs with virtually every recording label of the day. His two-sided single containing "The Prisoner's Song" and "Wreck of the Old '97" was the first million-selling country music record, and may have sold up to seven million copies – or more. To put that into comparison, that puts it on par with "Billie Jean," "Bohemian Rhapsody" and "Bridge Over Troubled Water." So why don’t more people know Vernon Dalhart’s name or his impact on American music? Or, for that matter, why he’s buried in Connecticut? I started my search for answers with the Texas State Historical Association. Music historian Laurie Jasinski told me Dalhart didn’t start out singing this kind of music: his passion was opera. Dalhart wanted to pursue his dreams. He left Texas for New York, toured with some opera companies, and then sang with various record labels, including Thomas Edison’s. One of these folk songs was “The Wreck of the Old ’97,” which would prove a huge hit for Dalhart. When “The Wreck of the Old ’97” started to sell, Dalhart took it to the big label – Victor Records. And “hillbilly” music soon became the rage. He used his newfound wealth to buy a mansion in Mamaroneck, New York, and settled there. Meanwhile, record producers scoured the South to find singers with authentic country twangs. Historian Bill Malone says, on the other hand, Dalhart had this opera quality to his voice. Dalhart’s record sales slowed. He lost of lot of money in the Depression. He sold his mansion and moved to Bridgeport around 1940. He worked as a night clerk in Bridgeport’s Barnum Hotel, and died less than a decade later, largely unknown. He’s buried in Mountain Grove Cemetery, in the heart of Bridgeport. It’s the same cemetery where P.T. Barnum and Tom Thumb are buried. But Dalhart’s not easy to find. For one thing, Vernon Dalhart wasn’t his real name – it was Marion T. Slaughter. He took the stage name of Vernon Dalhart by slapping together the names of two small Texas towns. In 1981, Vernon Dalhart was finally recognized by the Country Music Hall of Fame – as one of the first to introduce this genre to a national audience. And his greatest hit, “The Prisoner’s Song” has been covered by musicians from Johnny Cash to Loudon Wainwright III. Dunavin, Davis. "Why Is America's First Country Music Superstar Buried In Bridgeport?" WSHU. August 18, 2016. Accessed August 18, 2016. http://wshu.org/post/why-america-s-first-country-music-superstar-buried-bridgeport.